Looking for the Adorned In Grace Tacoma Website? Click here! In early 2015, Christine Gilge’s husband asked if she would like to merge her women’s ministry (which had been held in their home) with his dental office in Tacoma, WA, which he was planning on remodeling. That evening she went online to ask if anyone would like to donate gowns toward the ministry. Our Adorned In Grace team in Portland saw the post and offered to donate 300 dresses, which began the beautiful journey of Adorned In Grace Tacoma (AIGT). For the past several years AIGT’s team, led by Christine and a passionate team of volunteers, has focused on spreading awareness of human trafficking through the sales of bridal and formal gowns as well as being engaged in a multitude of community events, presentations, & teas to educate the public. Although a seemingly unusual partnership, the connection with the dental practice has been powerful: many of the patients have joined in the ministry in various ways, and human trafficking survivors have been able to receive practical job skills training in dental assisting. 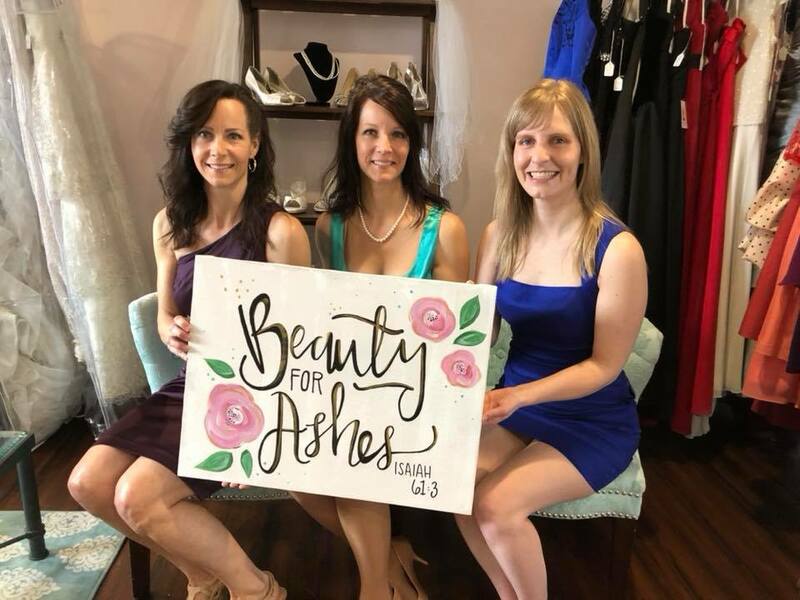 In 2018, AIGT opened a brand new bridal shop location in Lakewood, WA to help support their anti-trafficking work. E- Education and employment: providing mentoring & job/life skills classes, educating the public to the reality of human trafficking and equipping them with tools to become advocates, and providing a safe place for girls and survivors to heal from the past. Through our partnership with Solutions Dental, we also provide scholarships for survivors to participate in a dental assisting program. Learn: Increase your awareness about the reality of human trafficking and become equipped with tools to become an advocate. We offer workshops and retreats to any group or organization that are interested in getting involved. Contact us at aigtacoma@compassionconnect.com to learn more! Join us at the Grace Space: Do you or someone you know need help? We offer all types of classes and groups through our Ministry at the “Grace Space.” This is a safe and friendly environment where survivors or anyone in need can come and seek help. We also offer groups and classes such as painting, cooking and bible studies that anyone can join. For more information please give us a call! Check out our Newsletter: Read the latest version here!